I’m in Atlanta Thursday – along with other conservative bloggers and writers such as Robert Bluey and Captain Ed Morrissey – to interview former Speaker Newt Gingrich. The American Solutions conference is the occasion, but it’s also excuse for pundits to question whether or not Gingrich will officially enter the presidential race (after all, he has told us he won’t announce his intentions until after the conference). The answer to that question depends on whom you ask. One DC insider reminds me that longtime Gingrich adviser Rich Galen is currently advising another presidential candidate. While purely an “inside baseball” argument, allowing a top-aide to work for another candidate, I’m told, is a tell-tale sign Newt has never really been serious about running. Another cynical but commonly-held view is that Newt’s coquetry with running has always been a gimmick, designed to sell books, promote this conference, and ensure the former Speaker of the House continues to be invited as a regular guest on Fox News. But running for president -- and garnering favorable public relations attention -- are not mutually exclusive – especially if one does not care to win (and can thus avoid pandering to the masses). Candidates ranging from Pat Buchanan to Jesse Jackson have run for office, lost, and still managed to advance their cause, celebrity, and pocketbooks at the same time. Others care less about whether or not he will run, and tell me Gingrich simply should not run. Gingrich’s many critics like to point out that he already had his chance to take on the Clintons – and that he lost the political battle. But a maxim in politics is to hang a lantern on your problems, and thus, it could also be argued that Newt’s past experience with the Clintons has uniquely prepared him for the challenge. Facing such animadversion early in ones career is often a good thing. Gingrich has endured his share of ad hominem attacks, and probably knows the Clintons better than any of the other candidates. There’s something to be said about betting on a fighter who knows how to take a punch. The question of electability is another issue. It’s fair to say he was assailed and limned an ultra-conservative bogeyman of the right. As such, he is as divisive a figure as Hillary, and that takes away one of the only advantages a Republican candidate would have in a general election. Still, others argue that it’s now too late for Newt to run – or that he would simply bollix up the whole race. Without a doubt, the most likely winner of a Newt candidacy (aside from Newt inc.) would be former New York Mayor Rudy Giuliani. This is true for two reasons: First, Giuliani’s ceiling in a GOP Primary is likely about 30 percent, meaning no matter how well he does, he will never get more than 30 percent of Republicans to vote for him in a primary. 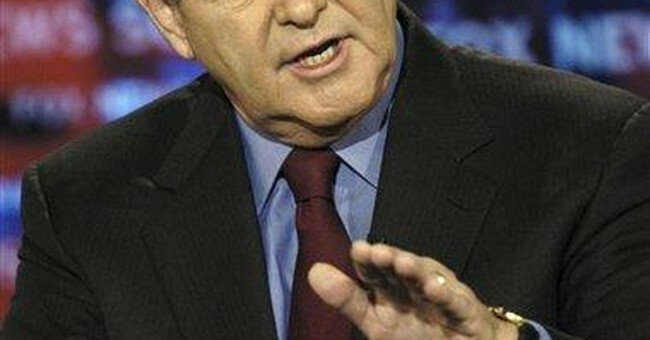 Newt’s entry would further dilute support for Romney and Thompson, paving the way for Giuliani to win the nomination. Second, Giuliani is likely the only candidate, in my estimation, is capable of holding his own intellectually against Newt in GOP debates. But while there are plenty of arguments for why Gingrich should not run, there is one big reason why he should: Substance. If you’ve been following the feckless candidates in the 2008 presidential race, it is clear Gingrich could, at least, enhance the debate. While pedantic nabobs don’t have a good win/loss track record in politics, let’s also not forget that while Ronald Reagan was effective at communicating complex ideas in a simple matter, he was, at heart a political philosopher, who read Bastiat, Hayek, and Whittaker Chambers, just to name a few. So Gingrich’s intellectual appeal may resonate more than you think. Will American Solutions ultimately be the opening salvo for Newt’s presidential campaign? Those of us who are hoping Newt will actually make an announcement once the conference ends are most likely going to be disappointed. His latest announcement -- that he will run only if he has $30 million pledged in advance -- strikes me as a perfect way to hedge his bets. Clearly, he views fundraising as infra dig, and challenging others to do the work for him allows him to either raise the money organically, or blame the system if it fails.